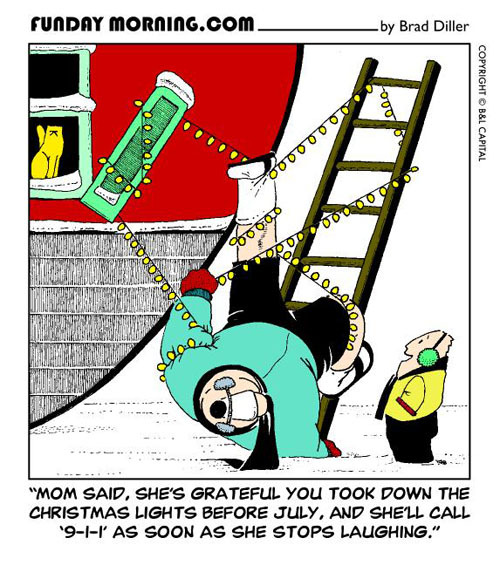 Here's a bit of post-holiday humor. I was always loath to put up tons of Christmas decorations, just to have to undo all the effort several weeks later. In protest, I've searched far and wide, looking for a string of lights with only one bulb. This would fit my sense of decor and humor, although it would still require the same effort to mount and dismount. Fortunately, I haven't found any. In keeping with my ingrained programming to put as little effort into anything I do, I based this cartoon on one I did last summer in order to minimize the amount of time it took to draw it. You can see it here.